Best known for their bridal blouses and snazzy lehengas, Smart Collection on Dispensary Road is popular for its embroidery and zardozi work. Prices start at INR 750. Around 55 years old, Smart Collection sees a steady stream of clients no matter what time of the day you drop by. 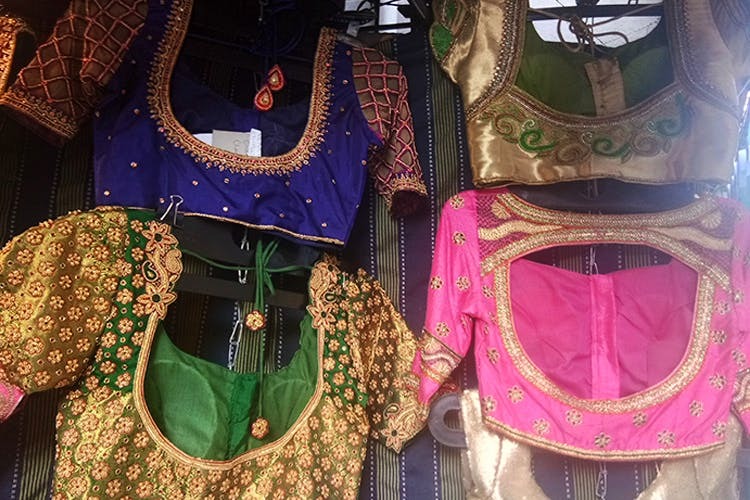 They are reputed for their blouses and are especially popular with brides and bridal parties. Of course, you can go to them with any design, including, the stylish Ikat or Ajrak print blouses or even the high-collared and long-sleeved ones that are so in vogue right now. But if you’d like your blouse to make a fashion statement of its own, then, Smart Collection will help you out with heavily embellished blouses. They are pros at all types of handiwork. You can go with simple borders or brocade ones that you can pick out at the shop itself. Or you can go with embroidery patterns or zardosi work. Lehengas too are a speciality here and, again, you can customise your design. Stitching charges for a lehenga begin at INR 1,200. You can also get salwar suits, saree falls and tassels done here. Delivery takes about a week. Prices begin at INR 750 but can go up to 7k depending on the amount of work you want done.